Motorists should pay less to fill their tanks now that repairs on a pipeline that delivers crude oil to Midwestern refineries are done. Enbridge Energy Partners planned to reopen the line in the Chicago area and begin supplying crude to those refineries Friday. Analysts say that should send pump prices lower. The national average for unleaded regular gasoline has risen about 5.5 cents in the past week to $2.740 a gallon on Friday, according to AAA, Wright Express and the Oil Price Information Service. That's about 19 cents more than a year ago. Drivers in the Midwest, including Wisconsin and Indiana, joined those on the West Coast in paying the highest prices, from $2.863 a gallon to $3.517 a gallon. Chicago-area drivers paid an average of $3.057 a gallon Friday, compared with $2.882 a gallon a week ago. The lowest gasoline prices were in Texas, parts of the South and Missouri. Although gasoline and oil supplies remain plentiful nationwide, the closed Enbridge Energy Partners pipeline caused concerns about supply problems for the affected refineries, said Tom Kloza, publisher and chief oil analyst at Oil Price Information Service. Now that the leak is plugged, it is "calming" for the market, he said. Prices should begin to "drift down" in the Midwest, which will send the national average lower, Kloza added. Benchmark crude oil fell slightly after a new report showed consumer sentiment moderated in September from the previous month. The University of Michigan/Reuters' preliminary reading of September consumer sentiment fell from August levels. 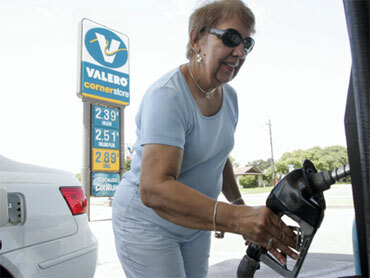 In addition, the Labor Department said consumer prices inched up 0.3 percent last month, excluding gasoline prices. The figure was essentially unchanged from July after three straight months of declines in prices. August energy prices rose 2.3 percent following a 2.6 percent July increase. In the past two months, gasoline prices have been increasing and were up 3.9 percent in August, at the end of the heavy summer driving season. Oil traders closely monitor U.S. economic growth and the equities markets to gauge consumer sentiment and potential shifts in demand. Oil for October delivery fell $1.19 to $73.38 a barrel in midday trading on the New York Mercantile Exchange. In other Nymex trading in October contracts, heating oil lost 2.12 cents at $2.0778 a gallon, gasoline dipped 1.44 cents to $1.9103 a gallon and natural gas fell 2.2 cents to $4.040 per 1,000 cubic feet. In London, Brent crude dropped $1.01 to $77.47 a barrel on the ICE Futures exchange.